Apple CEO Tim Cook offered remarks on globalization, cybersecurity, encryption, international relations and more during a rare public appearance in China, part of the executive's attempts to woo Chinese consumers. 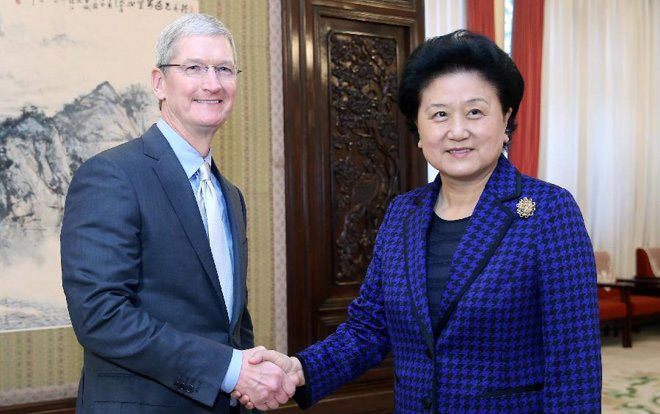 Apple CEO Tim Cook meets Chinese Vice Premier Liu Yandong in Beijing in 2015. As reported by The Wall Street Journal, Cook delivered commentary on world affairs during an hour-long address on Saturday at the China Development Forum, an annual conference sponsored by the Chinese government. The heads of western corporations sometimes attend the convention to bolster ties with high ranking officials in the Chinese central government, the report said. During his speech, Cook said globalization "in general is great for the world," but noted socioeconomic gains may not be evenly distributed within or between countries. Despite globalization's shortcomings, countries should not shy away from such development, he said. "I think the worst thing would be to — because it didn't help everyone — is to say it's bad and do less of that," Cook said. "I think the reality is you can see that countries in the world...that isolate themselves, it's not good for their people." The subject is a contentious one for Apple, a U.S. company that farms out a bulk of its manufacturing operations to China. President Donald Trump recently called for Apple to bring iPhone production to America, a move that would stimulate the domestic economy. Trump has asked the same of many U.S. multinationals in attempts to repatriate overseas jobs. Beyond economics, Cook touched on cybersecurity and user privacy, both highly sensitive subjects in China. Parroting past statements on the matter, Cook said Apple employs end-to-end encryption to protect its customers from nefarious actors. He fell short of taking a stand against Chinese cybersecurity policy that requires companies to furnish authorities with technical assistance in investigations and data gathering operations. Unlike the U.S., where Apple is an outspoken critic of government snooping — and last year went to court to fight Federal Bureau of Investigation demands to decrypt an iPhone — China is handled with kid gloves. Companies and individual who publicly oppose government mandate, especially when it comes to topics like cybersecurity, privacy and free speech, are often met with swift retaliation. At times, government responses can negatively impact business relations, which could be catastrophic to the bottom lines of companies like Apple. Cook tiptoed around the subject of data privacy, saying, "We think that an individual should own their data and should be able to control their data." He has made similar statements in the past, often using harsh words to condemn state-sponsored snooping, but the claws didn't come out today in China. Cook is in China to bolster relations with the country's central government. Apple's top executive is slated to speak with Xu Lin, director of the Cyberspace Administration of China, in a private meeting on Monday.